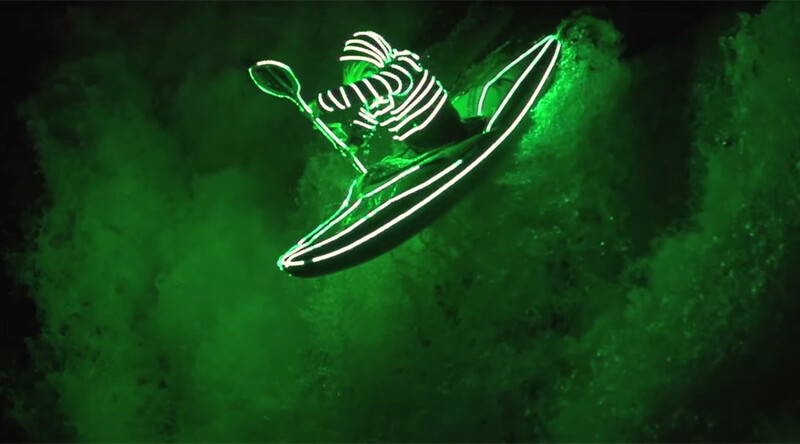 Two kayakers have filmed incredible, dream-like footage of their night-time paddle down river rapids and waterfalls, while suited up with flashing LEDs. The remarkable video shows brothers Brendan and Todd Wells illuminated in red and green against pitch-black conditions as they kayak their way down a waterfall on White Salmon River in Washington State. The brothers donned the LED suits to tackle ‘class v’ (class five) rapids and 70ft waterfalls for the awe-inspiring night shoot. “I paddle here with my brother on a regular basis and we have so much fun,” said Brendan, a professional kayaker, acknowledging the support the pair received from friends to pull off the spectacular stunt. The Wells brothers have filmed several impressive kayaking expeditions, but really pushed the limits creatively for this clip entitled ‘Liquid Illumination’. The video is part of a feature film the pair made documenting their passion for kayaking.